Major IndyCar team owner Chip Ganassi funded the DeltaWing project and Dan Gurney’s noted All-American Racers built it to be entered as an experimental racer at the 24 Hours of LeMans in 2012. Nissan provided the engine, originally a 1.6-liter turbo I4. At LeMans it qualified 29th out of 50+ cars and was running well before being involved in an accident with another racer. The following year the design moved to the American LeMans Series and continues in the United SportsCar Championship in 2014, but in an enclosed coupe version instead of the open-cockpit original design. 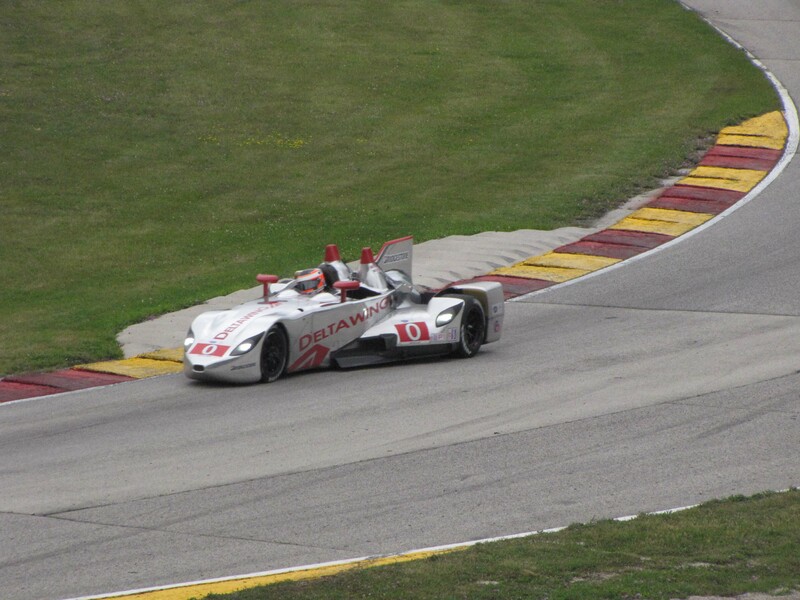 The coupe finished a best-ever 8th at the USCC race at Road America in Elkhart Lake, Wis., this year. Last year its open-cockpit version was 5th in the same race. I was there and its appearance on the track is startling, resembling a silver arrow shooting around the track. 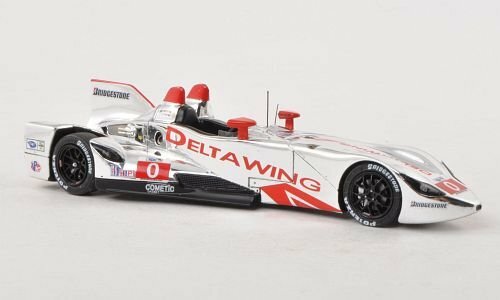 Spark’s flashy 1:43 version is of the DeltaWing that raced in the 12 Hours of Sebring in 2013. That car was raced by Oliver Pia and Andy Meyrick, not exactly household names. And to be honest, the Sebring race wasn’t a stellar outing for the Wing, its then Elan 1.9-liter turbo I4 expiring after just two hours. Yet that doesn’t matter if you want such an unusual car in your collection, and Spark gives you plenty to be excited about in this scale. Our test model was provided by Replicarz. In addition to the polished metal look silver body, this reproduced the two large red cockpit mirrors and fins above the two open seats, plus red trim along the rear vertical fin. Two tiny radio antenna protrude from the cockpit too, just in front of the racer’s second seat. 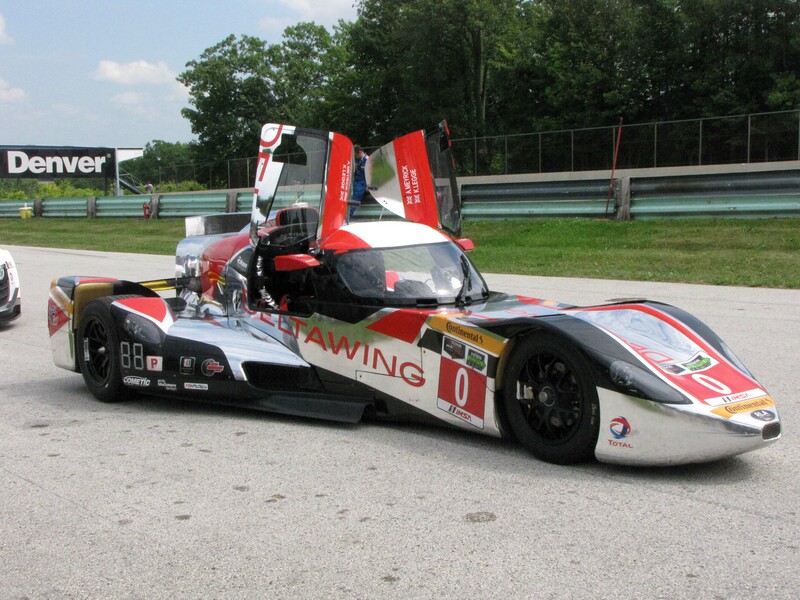 Here’s the real DeltaWing at Road America in 2013, where it finished fourth. The body work is cut away over the rear two wheels, which are appropriately labeled Bridgestone Potenza. There also are small clear lights in the front nose and side pods just in front of the rear tires. Also at the front of the pods are black photo-etch screens by black flaps that are designed to add downforce to the rear wheels. With no front or rear wings the DeltaWing relies primarily on downforce created by the car’s underside to help it corner well at speed. Each side has a black fuel fill cap and there are minimal sponsorship logos to clutter up the car. But these are realistic, including Bridgestone on the tail, the red DeltaWing on the nose and sides and both IMSA and American LeMans racing series logos, along with a few others such as VP Racing Fuels. The DeltaWing’s cockpit is typical for this scale of model, a black plastic that looks a little too shiny, but features molded in seat belts and harnesses, plus a black steering wheel with tiny specks on it to simulate buttons. 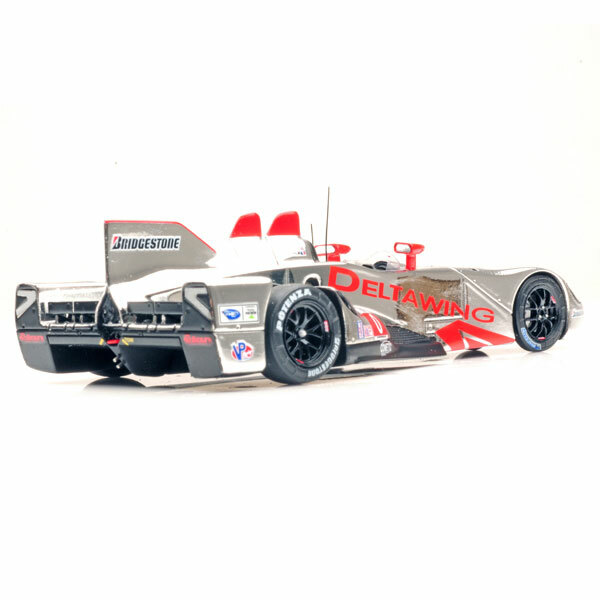 If you want super detail you’ll have to wait for a 1:18 scale version of the DeltaWing, if that ever comes. But in the smaller scale this is a highly attractive model that truly reflects the car’s original design and racy nature. It comes in a nice acrylic case with a red, white, and blue cardboard sleeve to increase its flash on the shelf. I can’t wait to put this one in my collection. Spark models are available through Replicarz, which provided the review model. For 2014 the DeltaWing became a coupe with an enclosed cockpit. This is in the pits at Road America.